A great alternative to the plastic frisbees. 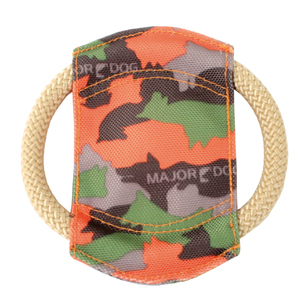 This fetch toy, the Major Dog Frisbee, is suitable for fun in the water or on land. There are so many Dog Frisbee on the market but it is hard to look past this one. Instead of the usual plastic design, it has a unique design. It is a soft material frisbee that is gentle on your dog’s teeth and gums. Not only does it fly well, it’s a favorite among dogs large and small. Plus it also folds away easily to fit in pockets and has its own squeaker. These toys have been designed to handle hours of throwing and catching fun. To be easy to clean and best of all it is gentle with your canine companions teeth and gums. Made with Major Dog’s usual quality specifications and materials (camouflaged material and polypropylene rope) and with its exceptional aerodynamic quality, and the ability to float on the water this Frisbee is a must have for play in the surf or on the turf. Not only are Major Dog products durable and fun but they are the first to be TüV-certified. This means these products meet the same rigorous contaminant testing as children’s toys.